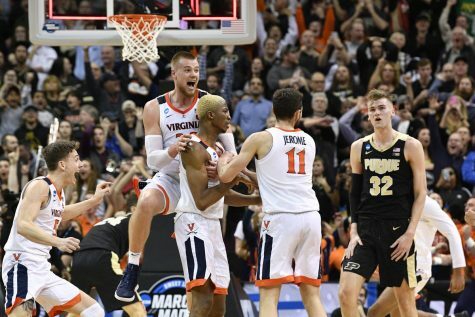 In dramatic fashion, the one-seeded powerhouse Virginia Cavaliers held off the three-seeded Texas Tech Red Raiders on Monday night in the NCAA national championship. On Saturday night, the two championship-bound teams had closely contested the Final Four games. 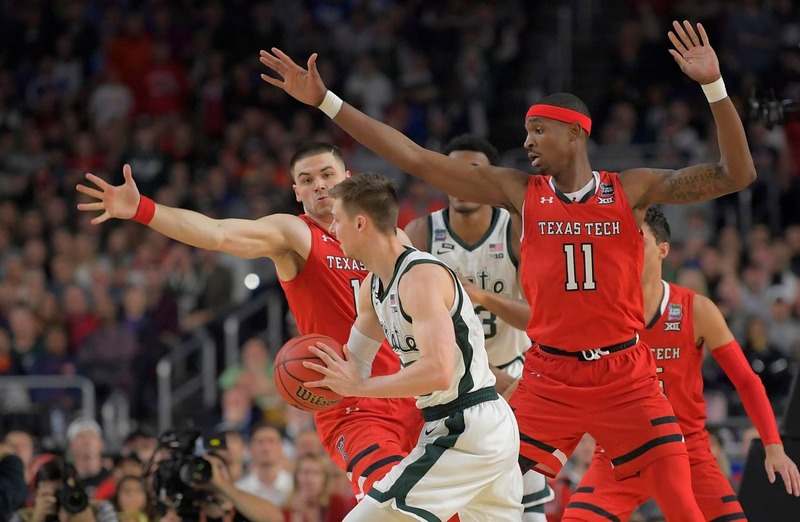 Texas Tech edged out the two-seeded Michigan State Spartans, 61-51, to get to the first championship game in program history. Then, after a controversial call on a three-point attempt from Virginia’s Kyle Guy, the Cavaliers escaped with a narrow 63-62 victory over Auburn. Virginia’s road to the national championship started with an alarming match-up against the No. 16 seed Gardner-Webb. Facing a six-point deficit at halftime, many thought the No. 1 seed would fall in the first round for the second straight tournament. However, Virginia erased Gardner-Webb’s lead after a debilitating 22-5 run that swayed the rest of the game in Virginia’s favor and led to a 71-56 win. Virginia seemed to have much more control of its second-round game against the No. 9 seed Oklahoma Sooners, winning 63-51. The Sooners were stifled by the Cavalier defense in the first half, shooting just 4-of-18 from the field in the first half and shooting only 37 percent by game’s end. The defense from Virginia held up, never letting their second half lead fall below 10 points. The Cavaliers had their closest win yet, 53-49, against the No. 12 seed Oregon. Virginia hadn’t had its best offensive game, including a season low in points (53) thanks to shooting 36 percent from the field. This game was more of a defensive game that made every single shot significant. One of the biggest shots of the game came from Virginia’s Ty Jerome, who knocked down a deep three to give his team a three-point lead with 3:33 left. After Oregon had consecutive empty possessions, Virginia sealed the game with free throws. The Elite 8 proved to a tougher matchup in an overtime thriller against the No. 9 seed Purdue. From a relentless 42-point performance from Purdue’s Carson Edwards and a minor ankle injury for Guy, the Cavaliers remained poised until the final minutes of overtime. Virginia forward Mamadi Diakite forced overtime as time expired with a jumpshot. Guy would return in the second half from his ankle injury to contribute game-sealing free throws. Despite his injury, Guy finished the game with a team-high 25 points to lift the Cavaliers past Purdue. Texas Tech’s slightly less dramatic journey to the national championship began with a 72-57 win against Northern Kentucky. Sophomore guard Jarrett Culver played a major factor in the win, scoring 29 points while tallying seven assists and eight rebounds. Behind the play of Culver, Texas Tech kept the lead to at least 10 points for the second half. The No. 6 seed Buffalo Bulls would stand no match for Texas Tech in the second round, losing by a staggering score of 78-58. The Bulls were on a hot winning streak of 13 games before meeting a Red Raiders’ stifling defense that held the Bulls to shoot a measly 36 percent from the field and score a season-low in points. A big 27-3 run from Texas Tech would ultimately determine the result of the game. Texas Tech’s defensive prowess carried over to the Sweet 16 against the No. 2 Michigan Wolverines. By the end of the first half, the Red Raiders allowed just 16 points. The defense would clog the paint and force the Wolverines into contested jump shots or ineffective drives toward the baseline. Despite Culver’s 22 points, Texas Tech’s defense was pivotal in their 63-44 win against Michigan. The next matchup would be the Red Raiders’ toughest in No. 1 Gonzaga, which came in boasting the nation’s best offense. Similar to previous rounds, the Red Raiders defense is what fueled their victory over Gonzaga. They caused Gonzaga to shoot 42 percent from the field, less than its average of 52 percent, as well as forcing their share of turnovers and leaving little room for any mistakes. The game was back and forth until there was about three minutes left. Texas Tech guard Davide Moretti hit two consecutive three pointers to give the team a six-point cushion. The Bulldogs were able to bring the score back to 71-69, but after a technical foul from Gonzaga in the final seconds of the game, Texas Tech pulled away to earn its place in the Final Four with a 75-69 win. On Monday night, the two programs’ fates will be decided in the national championship game on CBS. Texas Tech, a defensive-minded team with a chip on its shoulder, will play Virginia, a fan-favorite program coached by one of the NCAA’s best, Tony Bennett. Tune in to see two vastly different programs collide on college basketball’s biggest stage.